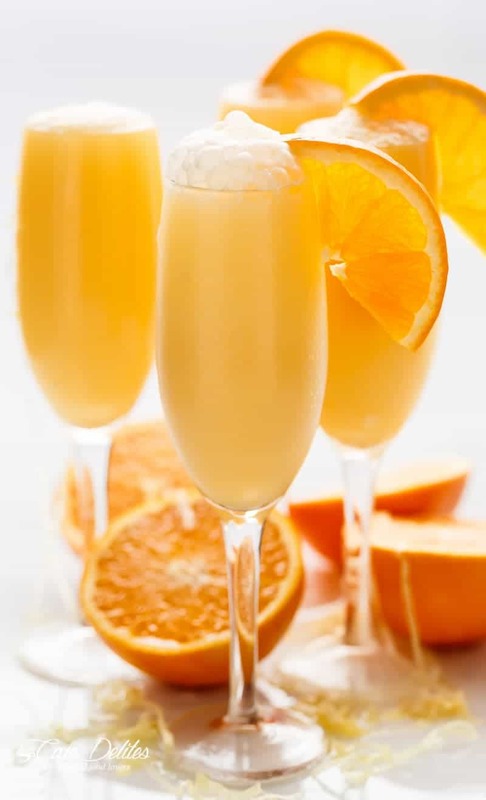 Orange Creamsicle Mimosas is a champagne cocktail that tastes just like a Creamsicle! The perfect refreshing beverage to add to your breakfast or brunch menu, 2017! 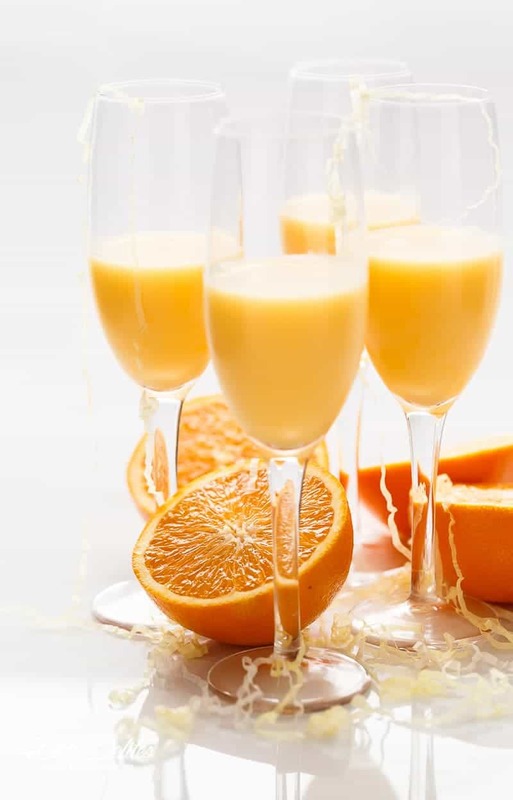 While all blogs will begin the year with detox salads and juices or cleanses of some sort, I thought I’d do something different for (or to) my readers, and share this Orange Creamsicle Mimosas. How come? Well, this was our pimped up brunch orange juice, celebrating a new day, a new year, and FINALLY some good health (well, we hope). How easy is this drink to make? So easy it almost feels like a crime to write out a recipe card. You start off with good quality orange juice. I use a natural orange juice, or you can squeeze your own juice. Mix the juice with half and half or cream (coconut cream would work here too). Give it all a mix and pour it into your champagne glasses. Top it all off with a good Prosecco, or your favourite sparkling white wine. (Pour it slowly because the champagne will bubble up and overflow.) Splash in some orange liqueur; garnish with a slice of orange and CHEERS! What exactly are we celebrating? It has been 5 days since I came out of hospital, and 9 days since I had surgery for severe endometriosis: a diagnosis that took a good 6 years to uncover. A chronic lower back and leg pain I had been living with for the past 6 years — with the last two years seeing me couch and bed bound. No physical activity like walking was even an option. Little things like shopping for groceries was excruciating, and guaranteed I’d be lying down in the middle of aisles, crying, until it passed. So how did I work? How do I post so many recipes weekly? With great difficulty. I’d cook for 5 minutes, walk/limp/hunched over to the couch for 10 minutes trying to stifle the screams and tears running down my face; repeat that process until the food was finished; then do it all again to style and photograph the food. THEN try to type out a post while lying down, guaranteed to smack the laptop screen on my face a few times. Yes, it has been hard. Many times I found myself desperate to give up and quit. But quitting is not in my nature (could be an Aries/stubborn thing). As we started 2017 today, I had a reason to celebrate. Being pain free (or semi-pain free while recovering), and healthy, was my first. This is why Orange Creamsicle Mimosas happened. And if you have reason to celebrate a new year or new beginnings, or just life in general, a BIG Salud to you! Cheers to good health and a HAPPY 2017! May all of your dreams come true! 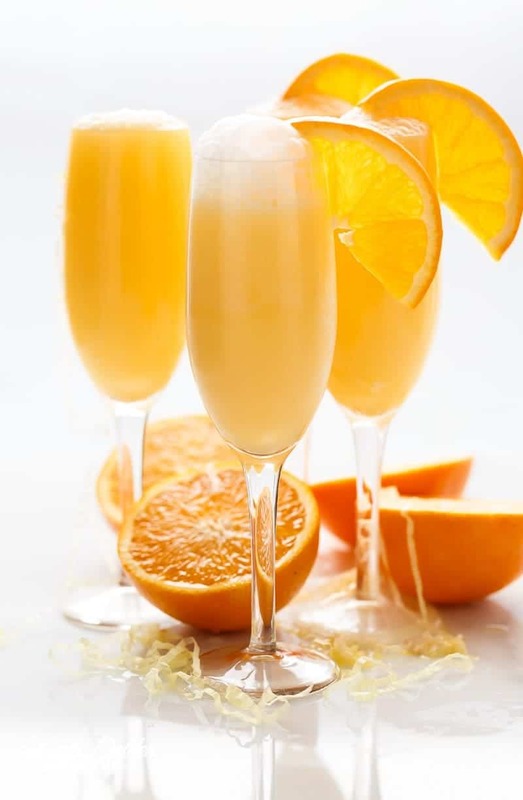 Orange Creamsicle Mimosas: the perfect refreshing beverage to add to your breakfast or brunch menu! 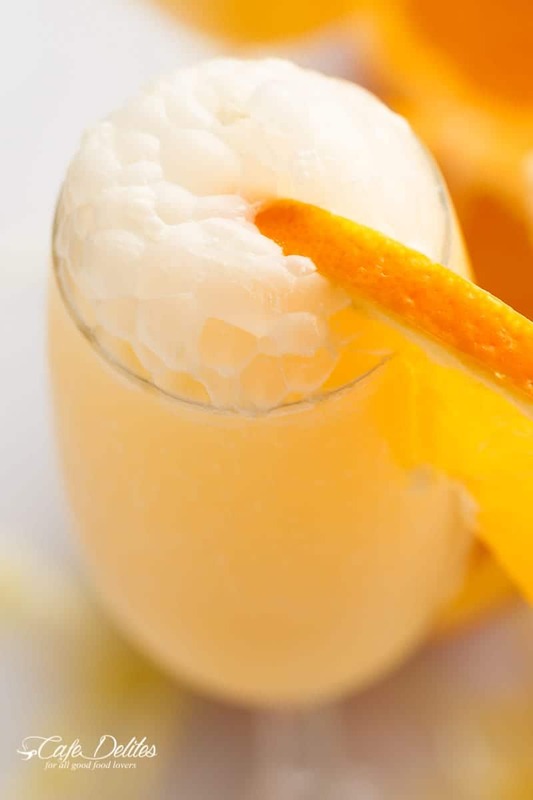 A champagne cocktail that tastes just like a Creamsicle! Chill champagne glasses in a refrigerator. Mix together the orange juice, half and half (or cream) until combined. Pour halfway into champagne glasses and slowly top each glass with champagne. Add in a splash of the liqueur (about 1/2 teaspoon per glass). Fill a glass about 3/4 with orange juice then fill the rest of the glass with whipped cream. It is so good! Do you think that this recipe can be multiplied and refrigerated to use for a party? Wow Karina! You are an amazing lady to maintain such a great website whilst experiencing such health problems. I have cooked many of your delicious recipes and am looking forward to trying the mimosas – they sound fabulous. All the best for a healthy future and please keep those recipes coming! Wishing you a complete recovery. Praying for you that you will be pain free. Take it easy in your recovery. I don’t know how you were able to cook and do this blog. God bless you and your family for a wonderful New Year. Congratulations on getting your surgery Karina. I’ve been there and know how awful endometrosis is. I went undiagnosed for over twenty years. I was almost dancing the day of my surgery and my life has been wonderful ever since, no one understands that pain unless they, too are having it. Please be very careful during your recovery so you can be pain free forever. This is. It the time to be stubborn! Thank you for all your wonderful recipes. I love to cook and enjoy your creativity very much. Best of luck to you and a very Happy New Year. Wow Laura! 20 years! I’m so happy to hear you’re completely fine now! And you’re right, no one understands how debilitating it can be. Endometriosis is the least understood and talked about disease. There needs to be more awareness for women suffering in silence! Best wishes to you too Laura and thank you for your message! Here’s to 2017 being amazing for us! I know how you feel. It’s been 12 years since I had a complete hysterectomy because of endometriosis. I’m praying for healing and that the pain will be gone. Take it easy, and let your body heal. I love your recipes and blog, you have a lot of people in your corner! Best wishes to you for a healthy 2017! You are an amazing and strong woman! Cheers!! So happy to hear you are on the mend after your surgery. God Bless. Pain is so exhausting and debilitating in itself, and so sorry you suffered for years before the cause was determined. May 2017 bring you complete health and joy. Thank you for this recipe; it sounds wonderful! Thank you so much Shirl! Have a great 2017! Wonderful recipe, and on just the right day? I haven’t made this but it sounds terrific. I might add a little Peach Schnapps or even Peach Lambic to the juice instead of Prosecco. Yum these look so good. They would be perfect for bruch.